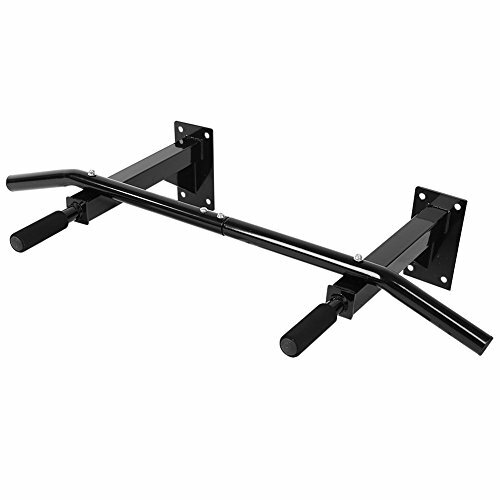 With this wall mounted chin up/pull up bar, you will no longer need to drive down to a gym to work out in a small, muggy& sweaty space and spend a fortune after a long day at work, or big dollars on a gym setup; this chin up/pull up bar will be ideal for home or light commercial use, perfect for gyms and any training places, all you need to do is to mount this kit to the wall, it will take your workout to the next level especially on the upper part, also a great addition any home or gym fitness training program; you can hang a boxing bag or suspension training gymnastic rings as you like. Dont hesitate, start right now on gaining strength, toning up, and losing weight to perfect your upper body! Made from heavy duty steel with black powder-coated paint. Excellent product for hanging boxing bags or gymnastic rings. Straps are made of commercial strength nylon webbing. Easy to assemble, mount on solid wall or wooden beam. Equipment supports weights up to 200kg. If you have any questions about this product by Ireav, contact us by completing and submitting the form below. If you are looking for a specif part number, please include it with your message.